A skilled thief on a mysterious mission, Carmen Sandiego is endlessly pursued by ACME and Interpol. But the woman in the red fedora is always one step ahead! 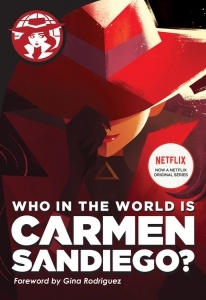 In this novelisation, based on the Netflix animated series, Carmen shares her own backstory for the first time ever. Now, it's time to find out. Who in the world is Carmen Sandiego. For decades, people have asked the question: Where in the world is Carmen Sandiego? But just who is this infamous and elusive globe-trotting criminal?